As an established commercial moving company for more than 35 years, Piedmont Moving Systems has filled many roles for our clients. We are known for providing comprehensive moving and storage services to companies that relocate all over the world. Piedmont also helps industrial manufacturers, health care providers, and commercial enterprises find solutions to the challenges of managing their inventory. Our warehouse facility provides storage of cutting-edge computer equipment and robotics used for a broad array of purposes. To keep these assets safe, we rely on an innovative warehousing management and inventory system. Our system tracks each item as it enters or leaves the facility, knows where items are located within the facility, and can even provide in-depth inventory data to customers online via a dedicated website. Perhaps, most importantly of all, we develop a tailored solution for your specific distribution requirements. Recently, Piedmont Moving Systems became the distributor for a client that manufactures million dollar surgical robots primarily for use during heart transplants. We manage and store the robots until they are distributed to the hospitals that purchase them for procedures. Each machine is stored in four large crates that are carefully wrapped and barcoded. 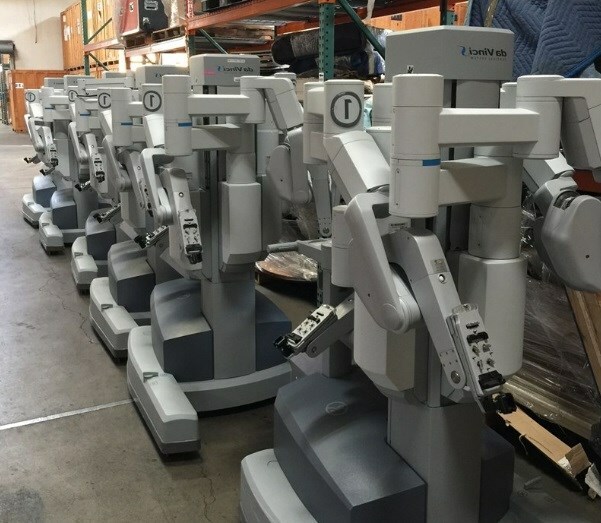 Piedmont also provides delivery of these robots to hospitals within California, and loads the crates onto trucks for other carriers that are hired to handle out-of-state relocations. We pick up completed robots from the manufacturer on a daily basis to keep safe and sound in our climate-controlled, surveilled warehouse. Our local movers will also deliver robots to hospitals, unload the crates using pallet jacks, bring them into the room for set up, and remove the robots from the crates for hospital staff. The mover will even pick up any debris and the empty crates before leaving. Real estate in California is at a premium, both in cost and simple availability. Plus, there are the complexities involved in buying a facility, hiring workers, and managing upkeep. It is much easier for businesses to use a pre-existing warehouse and distributor to manage their commercial, industrial, and health care logistics needs. Whether you need offsite storage of archived documents or life-saving medical equipment, Piedmont Moving Systems can handle all warehousing and transportation needed for your assets. Find out more by calling us or filling out our online quote form to request a free, in-person consultation.